During my Death Valley Eastern Sierra Experience Workshop I was taking some candid shots of the participants while they were in their moments of shooting the light at it’s peak. In the first image the arch is the main subject and in the second image it’s the photographer and what he is doing. I noticed the 2nd image to be even more powerful then the first and with a little bit of patience I was able to capture both images. This entry was posted on March 26, 2011 at 10:09 am and is filed under Uncategorized. You can follow any responses to this entry through the RSS 2.0 feed. You can leave a response, or trackback from your own site. I like the way the person makes the image stronger. I also see a face with the eyes as clouds and a mouth in the arch. 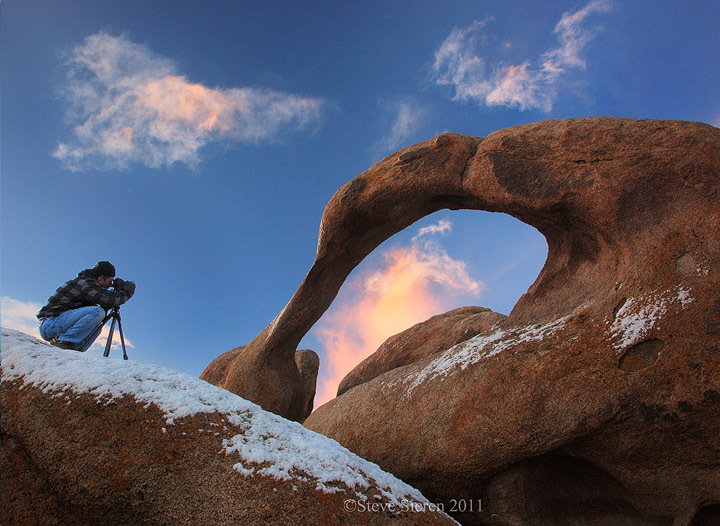 Now I’m wondering what he is shooting, probably an amazing sunrise if it’s the Alabama Hills? 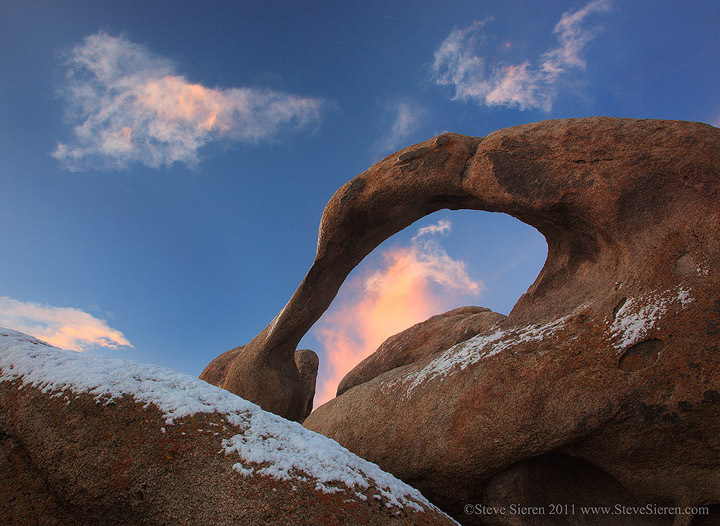 Great composition and light- sounds like a great time to be in Alabama hills! Jenny, I’m sure Bruce was waiting on the light to hit Lone Pine Peak!! Fantastic conditions that morning! Cheers. Dharshan, that was the first snow I experienced in the AH! I love this totally original view of the arch. Just amazing! I agree with Eric. I like the way you capitalized on those great colors in the sky and with an excellent composition, you made a unique image of a worn out subject. Hey David, I just got back today so sorry I missed you. If you have a chance on your way back home check the Antelope Poppy Fields or the Carrizo Plain it’s spectacular right now!! I’ll let you know when I’m up your way or at least near Tahoe.